Click here to view Jean's Liturgical Wake service. Click here to view Jean's Mass of Christian burial. Jean Louise Lingor, 84, of Aberdeen, passed away Tuesday, August 21, 2018, at her residence. Mass of Christian burial will be 10:30 a.m., Monday, August 27, 2018, at St. Mary’s Catholic Church, 409 2nd Avenue NE, Aberdeen, with Father Andy Thuringer as celebrant. Jean’s wishes were to be cremated with burial taking place at St. Mary’s Catholic Cemetery. Schriver’s Memorial Mortuary & Crematory, 414 5th Avenue NW, Aberdeen, is in charge of arrangements. Friends may sign Jean’s online guestbook and also view her service via the live stream service link at www.schriversmemorial.com. Visitation will be 3-5 p.m., Sunday, at the mortuary, with a liturgical wake service beginning at 5:00 p.m.
Jean Louise Meyer was born June 2, 1934, in Leola, SD to Harvey and Louise (Bain) Meyer. She was raised on a farm between Frederick, SD and Leola and attended country school. 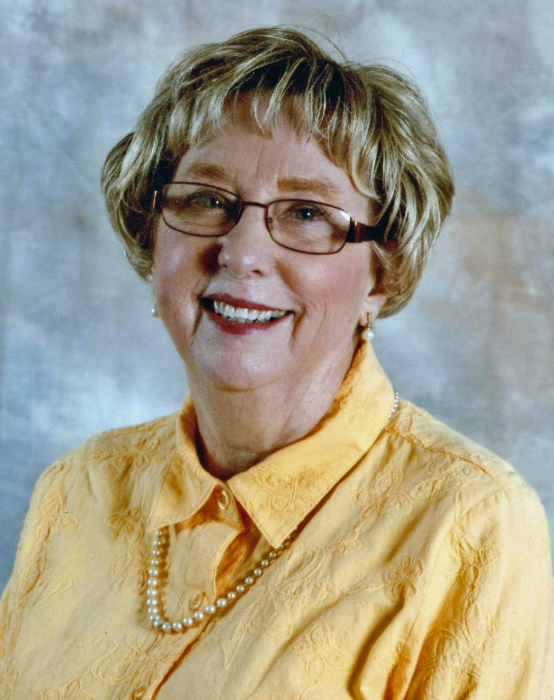 Following graduation from Leola High School, Jean moved to Aberdeen and furthered her education at the Aberdeen School of Commerce. Jean was united in marriage to Paul Lingor on September 4, 1954, in Aberdeen. The couple made Aberdeen their home, where Jean worked for St. Paul Fire and Marine Insurance Company, The Dakota Farmer, and St. Luke’s Hospital in the earlier years. In 1974, she then began what would become a 19-year long career working for The Department of Labor. Jean and Paul raised two children and shared 60 years of marriage before he passed away on December 12, 2014. Jean continued to reside in Aberdeen until the time of her death. Jean was a member of St. Mary’s Catholic Church, the Aberdeen Area Senior Center and The Red Hat Ladies. She loved exercising and socializing and was a long-time member of the YMCA and also of a Women’s Exercise Class at the Washington Street Gym. In her spare time, Jean loved travelling and enjoyed volunteering at St. Luke’s Hospital. Grateful for having shared in her life are her children: Allen (Barbara) Lingor of Georgetown, TX and Janeen (Craig) Connell of Eureka, SD; two grandchildren, Scott (Cassie Broeckert) Lingor of Austin, TX and Cami (Adam Stoddard) Connell of Minneapolis, MN; and one brother, Dwight Meyer of Mt. Pleasant, SC. Jean was preceded in death by her husband, Paul; her parents, Harvey and Louise; and one brother, Vern Meyer.